Last weekend I was at Heathrow twice. First on the Saturday to pick up Becks from the airport and then, only fourteen hours later, back again to catch a flight to Charlotte North Carolina. It was an incredibly poorly timed work trip as it essentially means that Becks and I haven't seen each other in just over three weeks. Here are some of the highs and lows. The first high has to be that I didn't loose my phone down the side of the seat on the plane (which luckily shot out due to the forces on landing). It was a bit of a whirlwind trip with only two days in Charlotte. I stayed in the rather plush Ritz Carlton hotel which had a lobby with a subtle smell of chocolate (although sadly no free samples). The room was well appointed, but mine faced into an internal atrium so it didn't have a great view. 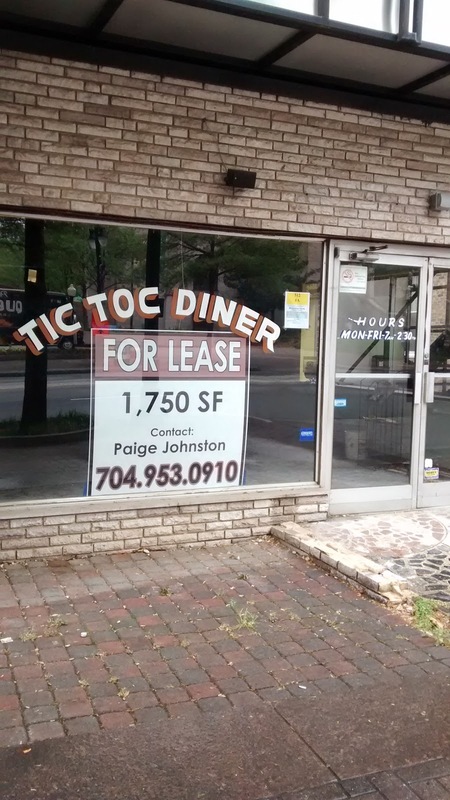 The Tick Tock Diner seems to have closed down. I did manage to fit in a couple of good meals while I was in Charlotte. The first was a lunch with work friends at Mert's Heart and Soul. Mert's is a classic Southern American restaurant and I decided to embrace with my Daily Fixin' of blackened pork chops, cornbread, collard greens and ocra and tomato ($12). It was tasty and (a bit too) substantial for lunch. That night I returned to The Kings Kitchen which I visited on my previous trip to Charlotte. The social enterprise was still serving up some great, and well presented, food with friendly service. 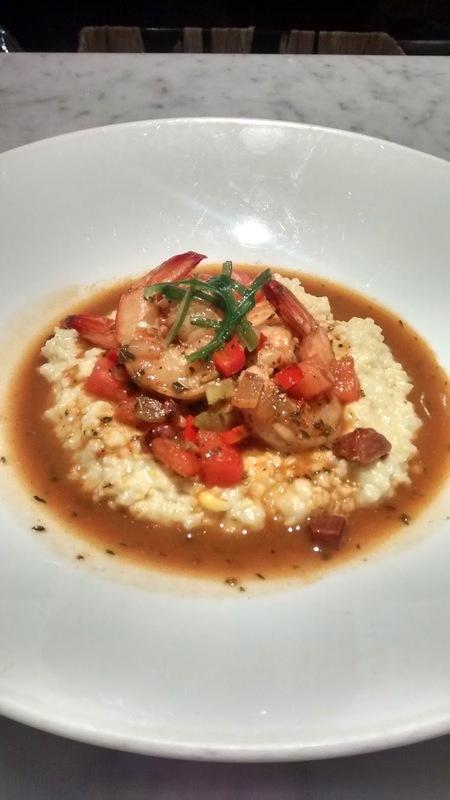 I had another southern classic of shrimp and grits ($19). Their prices have edged up since I last visited, but not dramatically so. Forty eight hours later I was back on a plane and heading to Chicago. The trip wasn't great (delayed flight, dreadful service and a taxi ride that made me feel queazy). It was my first trip to Chicago and the city immediately impressed me. It had the feeling of a less intense New York. A lot of the same architectural styles, but friendlier and slightly slower paced. Unfortunately I didn't managed to explore much of the city while I was there, although I did fit in two runs along the lake shore. On Wednesday night I headed north, and despite getting slightly lost at one point, stuck to the shoreline most of the way. I was then back out on the Thursday morning, heading south along the lake. There was quite a chilly breeze in the early morning and I could have done with my gloves! I managed to fit in a few good eats while I was there. The best was the pastrami sandwich ($9.99) I had from The French Market. Warm slices of tender beef, with some of their pickling spices still attached to the crust, were sandwiched between two slices of rye bread. Your choice of mustard came in a small pot on the side so you could add as much, or little, as you liked. It would have been great to get a pickle on the side as you do in many of the the NY delis. We had a team dinner at the Kenzie Chophouse. I haven't been to a steak restaurant in a long time and I really enjoyed the ribeye that I ordered. We were quite sensible with the side orders which I think was a smart move. While we were at dinner the Chicago classic Italian Beef Sandwich was discussed so I resolved to have lunch there on my final day. A quick bit of research and I discovered that this place was featured on the US TV show Man vs. Food. 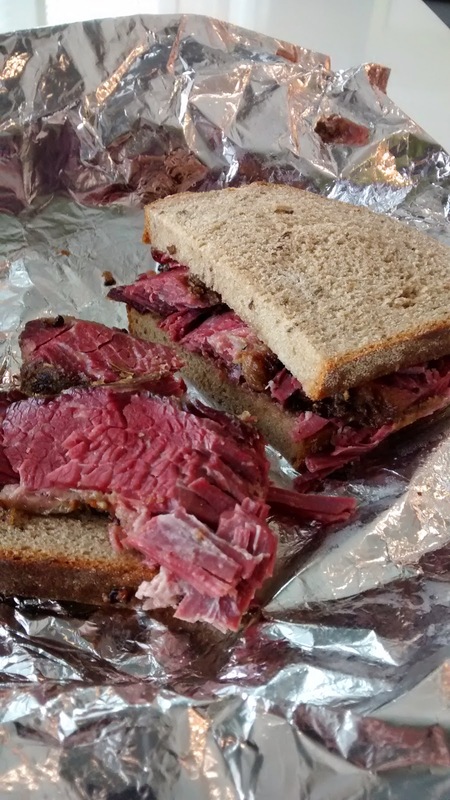 The beef sandwich was good, but not up to the standards of the pastrami which I'd had the day before. Lunch consumed it was straight to the airport for the flight home!